Designed in 1916 by G H Challenger and flown for the first time in August of that year, the F.B.19 was a single-bay unstaggered equi-span biplane with a single 7.7mm Vickers gun mounted on the port side of the fuselage and a 100hp Gnome Monosoupape engine. Ordered by the War Office for the RFC, the series version was powered by either the Gnome or the 110hp Le Rhone. Some 50 F.B.19s were built, and, late in 1916, a batch of six was sent to France where, after operational evaluation, the fighter was deemed un-suited for the fighting conditions then evolving. At this time, some of the F.B.19s were delivered to the Russian government following demonstrations in Petrograd, Moscow, Kiev and Tiflis, but several were still in their crates on the docks at Archangel at the commencement of the Bolshevik revolution. These aircraft were destroyed by the Royal Navy, but a few others assembled prior to the Navy's action were flown in Bolshevik service. 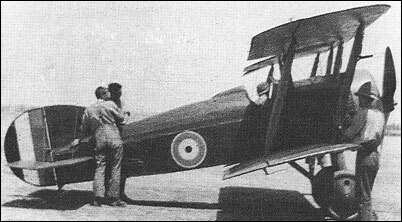 A modified version, the F.B.19 Mk II, was developed with wing stagger and either the Le Rhone or Clerget 110hp rotary. Only 12 Mk IIs were built and several of these were included in a batch of 12 F.B.19s sent to the Middle Eastern theatres of war. These were flown in Palestine and Macedonia from June 1917, but no squadron used the type exclusively and it was not well liked. Used by Nos 111 squadron in Palestine and 17 and 47 in Macedonia.possibly no 11 on the western front. Manoeuvrability appears to be its weakness. They seem to lose the Hun as he starts manoeuvring . Major Geneeral W S Branker. I am trying to put together fabrication drawings for the FB.19 Mk 1 as used in Russia just before and after the Revolution of 1917. Anyone know of existing drawings? but no squadron used the type exclusively and it was not well liked.